For many individuals, the ease of use offered by iPods and other media devices means that they can carry their music library wherever they go. So why should the bathroom remain silent? According to Better Homes and Gardens, small-scale sound systems are becoming increasingly popular in washrooms and homeowners can use modern bathroom accessories to blend them seamlessly into their space. A compact iPod dock is the ideal choice for your space that will allow you to carry a media device to and from the bathroom. Consider using compact shelving like floating wall shelves near your bathroom vanity or above your toilet. You can then tuck in the device on the shelf and surround it with a few photos, green plants and other decorative accents. On the other hand, if you're a serious audiophile, you can install two speakers into your space at opposite corners of the room. You can hide the media player underneath your sink and run the speaker cords along the perimeter of the floor to provide plenty of tunes while waking up in the morning or enjoying a stress-relieving bath. Sound systems are just one of the many modern conveniences that have found their way into bathrooms. 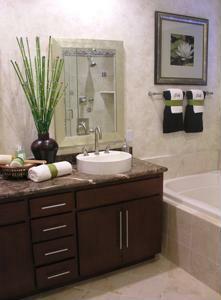 What tips do you have for homeowners looking to improve their bathroom's audio quality?